The Global Volcanism Program has no activity reports for Ol Doinyo Eburru. The Global Volcanism Program has no Weekly Reports available for Ol Doinyo Eburru. The Global Volcanism Program has no Bulletin Reports available for Ol Doinyo Eburru. Eburru volcano is elongated E-W perpendicular to the Gregory Rift NW of Lake Naivasha. The main edifice is eroded, but young partly vegetated rhyolitic domes occur on the E flank and are probably of Holocene age (Thompson and Dodson, 1963). Pleistocene phonolitic and trachytic lava flows are overlain by rhyolitic obsidian lava flows forming much of the N and NE slopes of the main massif. A prominent late-Pleistocene rhyolitic lava flow from a SE-flank vent extends almost to Lake Naivasha. Extensive fumarolic activity occurs at cinder cones and craters constructed along dominantly N-S faults cutting the massif. Thompson A O, Dodson R G, 1963. Geology of the Naivasha area. Geol Surv Kenya Rpt, 55: 1-80. The Global Volcanism Program is not aware of any Holocene eruptions from Ol Doinyo Eburru. If this volcano has had large eruptions (VEI >= 4) prior to 10,000 years ago, information might be found on the Ol Doinyo Eburru page in the LaMEVE (Large Magnitude Explosive Volcanic Eruptions) database, a part of the Volcano Global Risk Identification and Analysis Project (VOGRIPA). There is no Deformation History data available for Ol Doinyo Eburru. There is no Emissions History data available for Ol Doinyo Eburru. 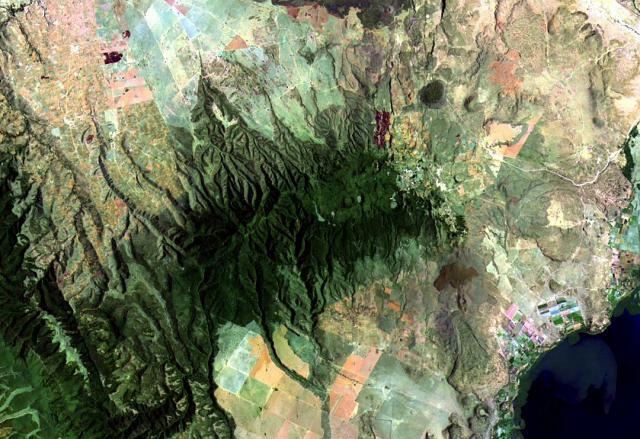 Vegetated Eburru volcano (center) is elongated perpendicular to the Gregory Rift NW of Lake Naivasha (lower right). The E-W-trending main edifice is eroded, but young craters cut the eastern part of the summit ridge, and partly vegetated, probably Holocene rhyolitic domes occur on the east flank. Extensive fumarolic activity occurs at cinder cones and craters constructed along faults cutting the massif. Lava flows of the Elmenteita Badlands are visible at the top-center portion of this Landsat image. There are no samples for Ol Doinyo Eburru in the Smithsonian's NMNH Department of Mineral Sciences Rock and Ore collection. IRIS seismic stations/networks Incorporated Research Institutions for Seismology (IRIS) Data Services map showing the location of seismic stations from all available networks (permanent or temporary) within a radius of 0.18° (about 20 km at mid-latitudes) from the given location of Ol Doinyo Eburru. Users can customize a variety of filters and options in the left panel. Note that if there are no stations are known the map will default to show the entire world with a "No data matched request" error notice. Large Eruptions of Ol Doinyo Eburru Information about large Quaternary eruptions (VEI >= 4) is cataloged in the Large Magnitude Explosive Volcanic Eruptions (LaMEVE) database of the Volcano Global Risk Identification and Analysis Project (VOGRIPA).